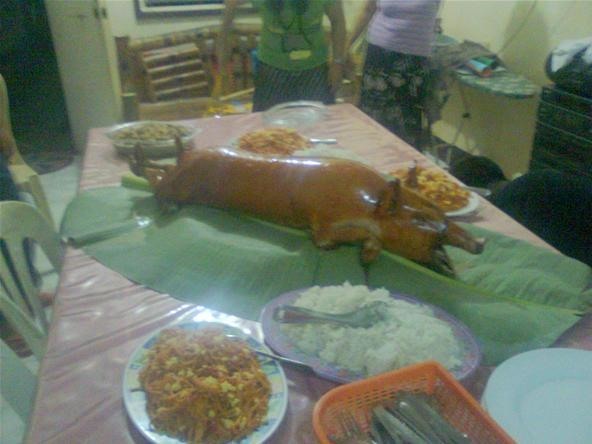 How I miss home and the roasted pig my mom and dad prepared for my birthday last year. What's the idea behind the roasted pig? In Filipino tradition having a roasted pig on your table in any occassion means that you're blessed and having a bountiful year. I wish I could go home again this year. It also reminds me of my favorite comic characters, Asterix and Obelix. Especially Obelix who really loves his roasted boar, and the vikings who makes any occassion a cause for celebration which really means free for all ale and roasted boars on the table. News: Is that a fish?